Winter is a magical time in the city of Cabo San Lucas, Mexico. From December through March, travelers can see immense gray whales and humpback whales in their natural habitat as they migrate through the Baja California region. If you’re visiting the Cabo San Lucas area during whale watching season, you’ll find plenty of incredible opportunities to see these fascinating animals in action. 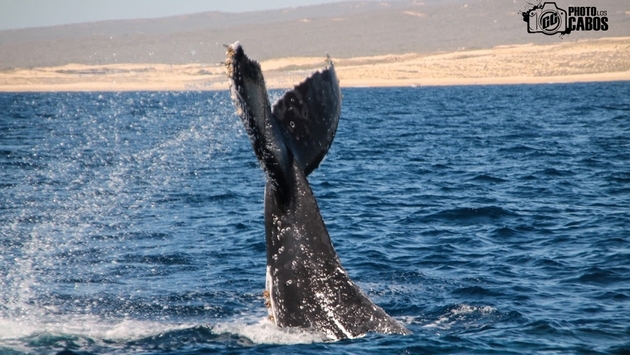 Guests staying at Sandos Finisterra Los Cabos resort enjoy a prime whale watching season location! The hotel is situated right by the Cabo San Lucas marina, where you’ll find plenty of whale watching tours available. If you’re lucky, you might even spot whales playing in the waters of the Pacific Ocean just of the coast of the hotel! The best viewing spots at Sandos Finisterra are in some of the upper-level ocean view guestrooms and hallways at dawn and at sunset, as well as the cliff-side terrace of the Whale Watcher Bar. Whale watching tours in Cabo San Lucas typically last two hours or more, and many will take you to other top local attractions on the way, like Land’s End Arch and the Sea Lion Colony. Typically you can find a variety of tours with different itineraries and intensity levels, depending on the experience you’d like. These expeditions are safe for adults and children alike, and safe for the whales, too! Tour captains strive to minimize the impact on the whales by keeping slow speeds and a safe distance so they don’t startle the animals. Over the years, whale watching tours have even contributed to the growing awareness needed to preserve these endangered species. The attention brought to these majestic creatures through whale watching tours is an important part of saving them. For an unbelievable whale watching season experience in Cabo San Lucas this winter, book your vacation at Sandos Finisterra Los Cabos! Originally from the United States, Laura Winfree has been living in the beach city of Cancun for nearly 10 years while showcasing her passion for Mexico as a travel writer and blogger. Throughout her time in southern Mexico, Laura has written travel-related articles for clients such as the Mexico Tourism Board, American Express, and Travel + Leisure, and she is currently the copywriter and blogger for Sandos Hotels & Resorts.